Lately we have been rolling out updates more frequently and our blog is getting bit cluttered with such posts. Its time to clean it up and so we are moving routine posts to our Updates Section. JA Admin template : A versatile Joomla Backend Template, which not only let you white label the backend but also lets you easily manage menu items, custom profiles / dashboards for different backend users. JA User Module (Free with JA Admin template) : Now view new members from EasySocial, Joomla etc in the backend DashBoard. JA Intranet Joomla Template : Supporting EasySocial, EasyDiscuss, Docman for Intranet sites. JA Resume Joomla template : For personal / portfolio Joomla sites. JA MegaStore Joomla Template : For Joomla ecommerce sites, supports Virtuemart featuring vertical megamenu. JA Restaurant Joomla template : Best of the Joomla Restaurant template so far. JA Image Hotspot (Free) : New version with new features and improvements, now supports four content types. JA promoBar (free) : New version with UI improvements, pre-set themes and URL builder for analytics. K2 to com content Migrator : New version with undo migration feature. JA Quick Contact module : Now with multiple layouts to choose from. JA Social feeds : Now supports RSS feeds also, auto populate your news section now. 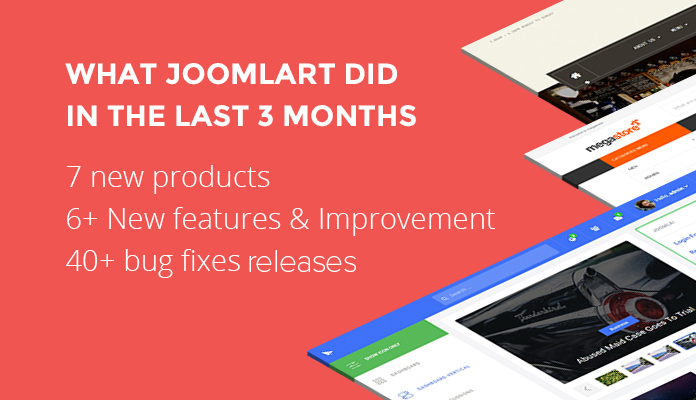 40+ templates were updated for latest Joomla version and bug fixes in the past 2-3 months. View complete list and changelog on our Updates Portal. Filter component for Ecommerce (starting with Virtuemart) is being released with the next monthly template. This Filter component will be extended for other extensions too. Multipurpose flexible featured template in already under development, something on the lines of Uber template but NOT Uber, rather a totally new product with tons of features. More updates are being lined up as we wrap up this year. Let us know if you want us to work on any leftover issue in the comments below and we will get those worked upon at an earliest.